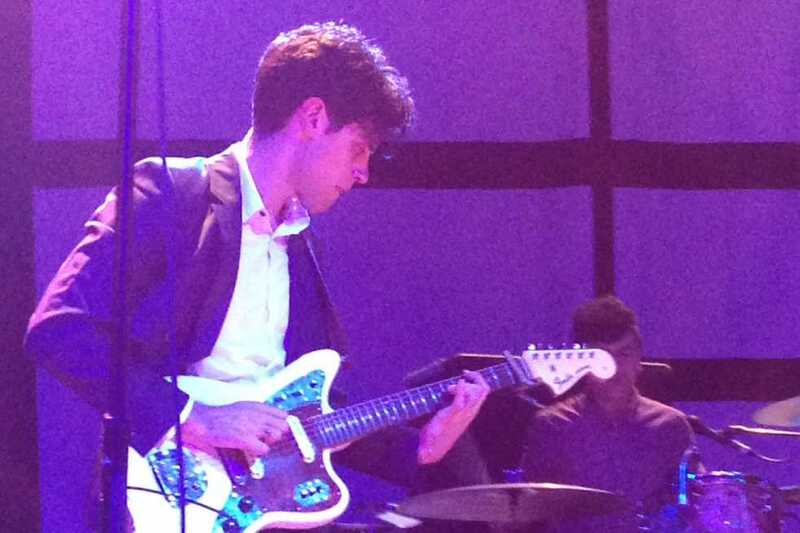 Standing before shouting fans, inside the changing colors of the stage lights, the well-dressed band members of Noah And The Whale ignited the night with the appropriate song “Tonight’s the Kind of Night” from their third album, Last Night On Earth. Noah And The Whale is a London-based indie band formed in 2008. The band members are Charlie Fink (front man, guitar), Tom Hobden (violin, keys), Matt “Urby” Owens (bass) and Fred Abbot (keys, guitar). The band released three albums before 2012 and is currently touring in North America to promote their fourth album, Heart Of Nowhere. On Oct. 15, they performed at Variety Playhouse in the heart of Little Five Points. Variety Playhouse was once a movie theater, and although it now serves as a venue, cinematic elements are still preserved. The sloping floor leads to an open spot in front of the stage, which is surrounded by old-theater style seats. The native Atlantan band Small Reactions opened the show with original tunes, which they describe as “angular” and “noisy.” The opener set the stage for a splendid night of music. After an endless wait, the stage finally turned dark. From the first beam of light and the first note of music, everyone was on their feet screaming and singing along with Noah and the Whale’s the opening song. The native Atlantan band Small Reactions opened the show with original tunes. “Heart of Nowhere,” the titular song of the band’s newest album, followed the opener along with songs from their third album Last Night on Earth and their first album Peaceful the World Lays Me Down. Of the twenty songs that Noah And The Whale played, seventeen were from previous albums. After the hit song “Jocasta,” there was a technical issue with the violin and Fink began a scavenger hunt with the fans for songs without violins. Although many of their songs require the violin, the band managed to play two slow songs “Blue Sky” and “Slow Glass” from their second album, The First Days of Spring. Before the audience could immerse themselves in the heartbreaking emotions of the songs, however, the band changed to the light and joyful “2 Atoms In A Molecule” and an improvised version of “Life is Life.” After the technical problem was resolved, the band flowed smoothly to their hit song from the last album “L.I.F.E.G.O.E.S.O.N.” After playing the audience’s request of “Mary,” the band and Fink did a 20-second funk style impromptu and announced the show as the best they have done during their North American tour. Though a similar technical problem occurred once again, the band’s elation remained, and everyone was engrossed in the music. Noah and the Whale landed a great show and their interaction with the audience was excellent. Noah and the Whale performed a great show and their interaction with the audience was excellent. Most of the audience members were fans who sang along the whole time. At one point, the band taught the audience the chorus of “Old Joy” and finished the song together. Variety Playhouse’s cinematic setting complemented the band’s storytelling-style lyrics, making the whole show more vivid and the night more memorable.